The LC8060 LED's brilliant array of 90 white LED bulbs generates virtually shadow-free light with low heat emission for superior luminosity, convenience and economy. And bulbs never need replacing. Bring work up close and personal with the removable 125mm (5in), 3-dioptre (1.75x magnification) glass lens. And magnify even smaller details with the optional LC8060L 5-dioptre (2.25x magnification) replacement lens. Swapping is swift and simple.
. . . and more! The handy SHESTO device features a built-in handle and sun protector cap - as well as generous 1.6m (63â€) power chord. It's perfect office or pastime lighting. 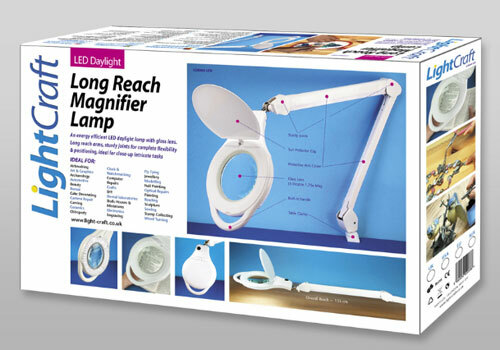 SHESTO's popular LIGHTCRAFT line also includes spares and accessories. See below for details.